The Saber EZ Outdoor Kitchen comes in several different variations. 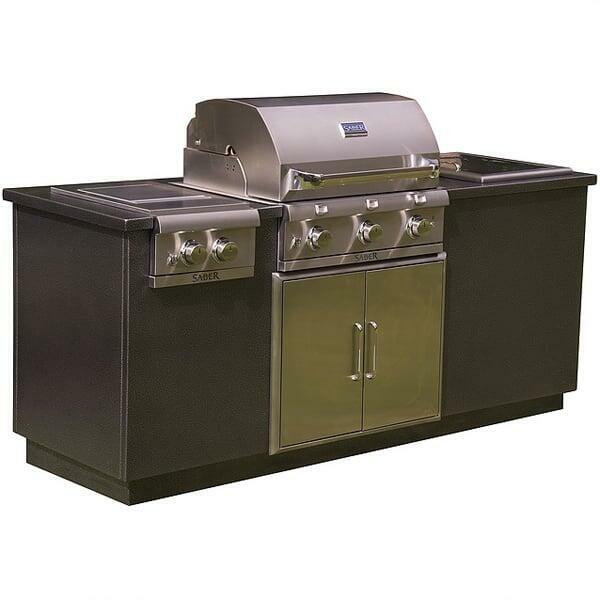 The I-Series design features a built-in Saber grill head, a built-in dual side burner, a drop-in ice chest, and a double access door that opens to house storage space. The I Series grill islands come in two different variations, too, including the featured silver color, and a copper color, which is viewable by a separate page. Saber Grill components are some of the most competitive outdoor kitchen items on the market because they are made with the highest quality outdoor 304-grade stainless steel and they outperform other brands for the entire duration of use. The Saber EZ Outdoor Kitchen I Series in Silver ships directly to your doorstep. It is easy to assemble in less than 45 minutes, and will surely change the face of your outdoor grilling game for a lifetime. This item requires freight delivery. This shipping method uses a full size semi - truck and product can be delivered to a street side location or into a room of choice based on the level of service requested. A representative will call to schedule your delivery which will require a signature upon receipt. Most delivery times within the Continental U.S. range from 5-7 days on in stock merchandise. Special order products ranges from 2-6 weeks depending on the manufacturer.